As a father of several young children, I get exposed to a lot of great entertainment that I never would have watched otherwise. Transformers: Rescue Bots, Scooby Doo! Mystery Incorporated, and Octonauts are all surprisingly engaging in their own unique ways. 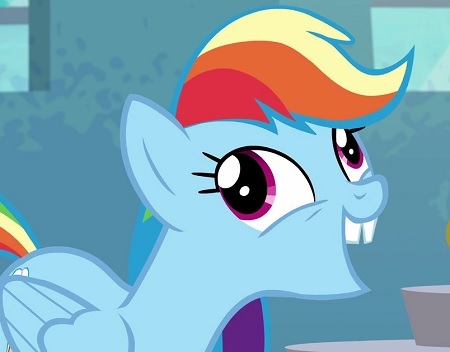 But the show that really takes the cake, offering refreshingly complex stories and sound moral lessons, is none other than My Little Pony: Friendship Is Magic. I know, with a name like that you’d think it would be a complete waste of time. Just a puff of sing-songy nothingness drenched in sunshine and rainbows. But that’s not what this TV show is at all. It’ll take a while to describe everything that makes My Little Pony: Friendship Is Magic work so perfectly, so let’s start hoofing it! The main characters are always true to their nature. Each one represents a different attribute of friendship, and they always act in accordance with that attribute. Each character possesses one of the Elements of Harmony. Applejack represents honesty, Fluttershy kindness, Pinkie Pie laughter, Rarity generosity, Rainbow Dash loyalty. And Twilight Sparkle? She represents the most powerful element of all, the combination of all of the other Elements of Harmony – magic. It’s only by befriending the five holders of the other elements that Twilight Sparkle discovers this mysterious power within herself. Hence, the “Friendship Is Magic” part of the show’s title. Every voice actor gives it their all and adds something special to their role. Tara Strong does the voice of Twilight Sparkle, and that’s pretty much it for her. But many of the other actresses provide voices for at least one other major character. Ashleigh Ball does the voices of Applejack and Rainbow Dash. Andrea Libman does the voices of Fluttershy and Pinkie Pie. Tabitha St. Germain does the voices of Rarity, Princess Luna, and Granny Smith. Cathy Weseluck does the voices of Spike and Mayor Mare. So whenever these characters interact with each other, there’s a whole other layer of meta-text that you can read into it. For example, when Princess Luna shows Sweetie Belle how her actions will negatively affect her big sister Rarity, it’s even more satisfying to know that the actress behind her voice belongs to Rarity, as well. 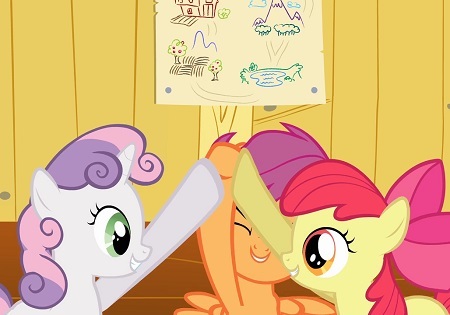 And when Rarity is arguing with Applejack and telling her what a slob she is during their first slumber party together, it’s that much more fun to know that Applejack’s grandma Granny Smith is also voiced by Rarity. 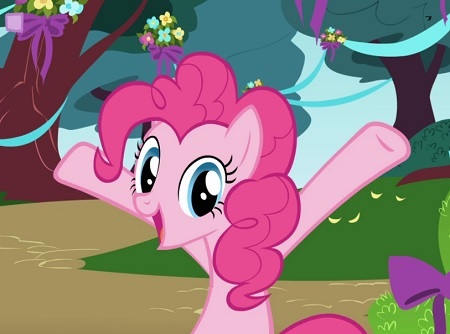 Oh, and whenever you hear Pinkie Pie going crazy and hollering her head off, keep in mind that she is voiced by the same actress who does the meek and humble Fluttershy. But my favorite moment comes in the episode where Rainbow Dash finally gets to realize her life’s ambition as she’s admitted into the Wonderbolts. She doesn’t want to make a fool of herself, so she decides to mimic the attributes of her closest friends. It gets all kinds of meta when she impersonates Applejack. The actress does both of their voices, but she manages to make Rainbow Dash appear to be doing her best to sound like Applejack. It is truly stunning, and it had me equally in stitches and in awe at how flawlessly she pulled that trick off. 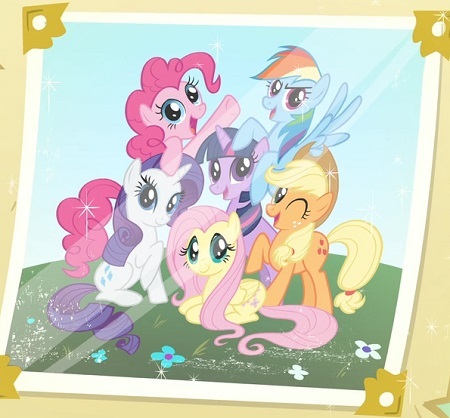 From the very first two-part episode, My Little Pony has been about turning enemies into friends. Just about every time a bad guy appears, whether it’s a cosmic being from the moon or a schoolyard bully, they wind up leaving their wicked ways behind once they get a taste of true friendship. That is the power of friendship in this show. No character is so evil that they are beyond redemption. Tirek is the only exception to this rule that I can think of. He is a villain, through and through, but there is still hope for him because his brother turned out to be a good guy, so there’s nothing stopping Tirek from doing the same someday. I am constantly amazed at how well My Little Pony unravels its story. Every episode is exploring a character’s personality, testing two characters’ friendship, and/or moving the story forward. And, believe me, the story is building up to something great. After you get through the first season, which does a great job of setting up characters and the world they live in, we finally get to the real meat from season 2 and on. Season 4 is probably my favorite, although every season is a delight to watch. I love that no detail is forgotten. The very first time we see Twilight Sparkle, she has to ditch her friends. It seems like such an afterthought on the writers’ part, but it turns out to be a pivotal moment, as we discover many episodes later. Callbacks to previous episodes are done seamlessly and brilliantly. And even seemingly minor characters get long-running story arcs that are incredibly compelling. The best of these is the one involving the three Cutie-Mark Crusaders, which are tiny ponies who obsess over finding their purpose in life. They try all sorts of activities to see if they are what they should be focusing on and they help a lot of other ponies, and even a griffin, discover their true destinies while they struggle to figure out their own. The end of their journey is so fantastic because it involves not only turning an enemy into a friend, but it’s also the beginning of a much bigger adventure for them. Beyond the solid characters and flowing story, the one thing that elevates My Little Pony: Friendship Is Magic above a simple enjoyable kids show into a full-blown treasure is the presence of a little character called Discord. He is the master of chaos, which is the opposite of harmony. So he’s the perfect foil for the six main characters who possess the Elements of Harmony. 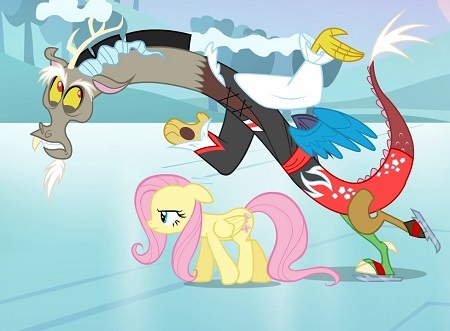 I watched the show a little out of order, so I knew that Discord would show up again after his initial two-parter at the start of season 2. My wife had described him as acting a lot like Q from Star Trek: The Next Generation. She was surprised when I watched an episode with him in it and I said, “That is Q!” She didn’t understand what I meant until we got to the end credits and she saw that John de Lancie does his voice. Discord is everything right about this show. He’s basically every male who watches My Little Pony: Friendship Is Magic. All of the ponies take the magical land of Equestria for granted. They just accept the reality of cutie marks, zap apples, magical unicorns and flying Pegasi as a daily occurrence, not to be questioned. But Discord throws a monkeywrench into the works when he pops up. He’s able to bend the very fabric of reality, and he frequently calls the ponies out on their rosy view of existence. He sometimes has a point, but he also has a lot to learn from the ponies. In fact, at one point he’s forced to recognize the fact that friendship is such a powerful magic that it can tame his insatiable desire for freedom from all rules and restrictions. When he accepts that he cares about what Fluttershy thinks of him, he grudgingly admits, “Friendship is magic.” And at that point, the show completely wins over any possible skeptics in the audience. Discord is a reformed villain who goes through a lot of growth as a character while still remaining true to his fun-loving spirit. And he’s voiced by a man who makes the universe sound like a little plaything in his back pocket just by the way he talks about it with that suave, condescending voice of his. There is just so much depth and complexity to Discord that gets explored, particularly at the end of season 4. As soon as Discord shows up, he pretty much plays the same role as Q, flashing in and out of the picture with a snap of his fingers. And he goes through a lot of similar growth as that other omnipotent character. Discord is a perfect addition to the cast, and he’s emblematic of the show, proving definitively that friendship is magic. I haven’t done justice to My Little Pony: Friendship Is Magic’s beautiful songs, comedy, creativity, and clever horse-related puns. To be honest, I could fill several articles with all of the nuances that make this show so great to watch. I highly recommend it. Like friendship itself, My Little Pony is something you just have to experience for yourself to truly understand its magic. This entry was posted in Pleasant Surprises and tagged animals, cartoon, comedy, discord, friendship, fun, funny, humor, my little pony, relationships, TV shows. Bookmark the permalink. Very insightful as usual. I would never have thought of My Little Pony as having deep messages. I kind of expected it to be like Care Bears which is to say, “It makes my brain hurt”, so thanks for putting that myth to rest for me.